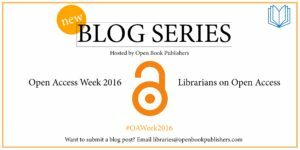 Open Access Week – Librarian Bloggers Needed! Open Access week is fast approaching! There are some fantastic events and other projects in the OA Week lineup, all available to look through on the OA Week website. We already have several librarians participating, including the wonderful Kyle Brady from the University of St Andrews who runs the University’s Open Access blog. We’d love it if you contributed too! The blog post would preferably consist of around 500-700 words, discussing your thoughts on Open Access books – it doesn’t matter what your role within the library is, or the angle that you come at the post from; we just want to hear your thoughts! If you’d like to participate let us know asap, and please send your blog post to libraries@openbookpublishers.com by 21/10/2016. Of course don’t hesitate to get in touch if you have any questions.